Last week, with the release of the tax changes planned by President Trump and leaders of the US Congress, North Carolina taxpayers braced themselves for another layer of experimentation that is sure to fail our communities and our economy. New data released today by the Institute on Taxation and Economic Policy confirms that the tax changes will primarily benefit the country’s wealthiest taxpayers, fail to target the middle class and reduce the ability to fund core public services in all 50 states. 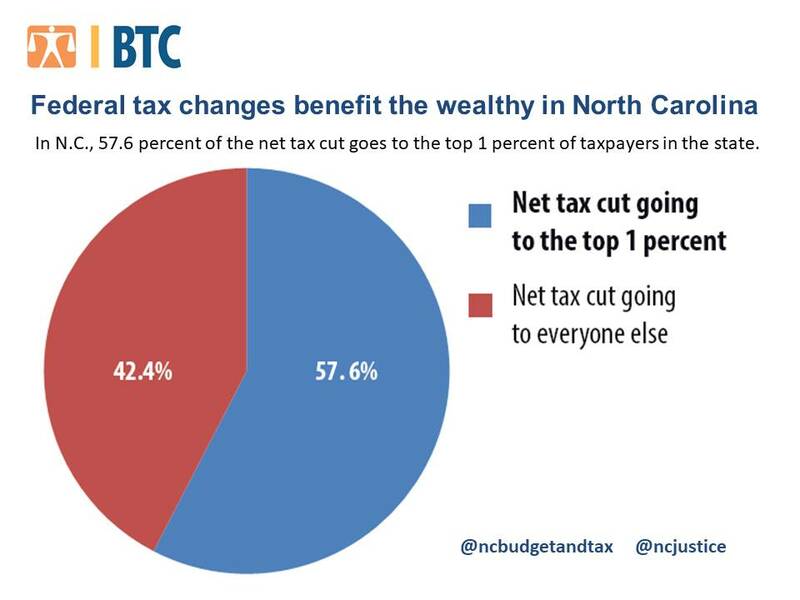 In North Carolina, 57.6 percent of the net tax cut goes to the top 1 percent of taxpayers in the state. While better than the national figure of 67.4 percent, it is a staggering figure signaling the failure to achieve the middle-class tax cut promised. Federal tax changes will make worse our already failed tax cut experiment in North Carolina. We have documented how the tax changes have meant fewer dollars for the classroom and for our communities. Cutting taxes for the wealthiest did not strengthen our state’s economy, and doing so at the national level could hurt the national expansion underway that has driven NC’s recovery to date. Federal tax changes will result in $1.6 trillion revenue loss over the next ten years nationally that will make it even more difficult to meet the needs of our growing state. North Carolina is spending at a historic low, even as our population grows, our infrastructure needs updating and our communities need help to thrive. Federal dollars have historically played an important role in meeting our priorities as a state. The tax changes proposed will likely lead to significant cuts to many of the programs that support the health and well-being of older North Carolinians, the building and maintenance of infrastructure and basic utilities, and the education of our children. Federal tax changes will push the costs to future generations as current proposals call for increasing the deficit by $1.5 trillion. Children will pay the price for fewer resources in their schools and fewer supports for their healthy development. And as adults they will pay in the form of higher debt for the nation that the federal changes would force. North Carolina has already experimented with tax changes that primarily benefit the few at the cost of us all. That experiment has failed. Expecting a different outcome at the federal level would be ridiculous.